Can baby boomers hand over their keys and stay connected? Kristina Challands is studying how over 65s can stay connected after they hand over their license. Time is ticking for baby boomers, with many older drivers fearing the day they hand over their license as a day they will lose their independence. In a new study, QUT Faculty of Health Honours researcher Kristina Challands, is looking at how the over 65s will stay connected once they hand over their keys and whether connecting online can replace face-to-face relationships that are made easier with a license. 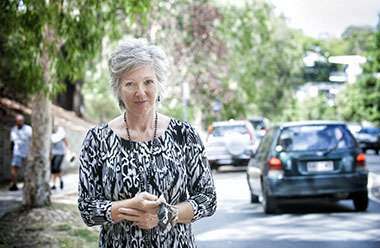 "In the next 15 years, the number of Australian license holders over the age of 65 is predicted to double, meaning we will see about 22 per cent of the population with a likelihood of reduced mobility as they age as a result of self-regulating driving or being without a license," Ms Challands said. "The concern is that taking away a person's license also takes away their independence and mobility and studies have shown that quality of life declines for older drivers who drive less or not all. "What my study aims to do is examine whether online social connectedness is the same as face-to-face relationships for the over 65s, and see if there is the potential for online friends to buffer the impact for drivers who reduce their driving or surrender their license." Ms Challands said research had shown the benefits of online connectedness for young people and also those with a disability, but there was limited information looking at people over 65. "If online social connectedness can reduce depression and generate social support in younger adults it may also buffer declines in quality of life for older adults during the stressful experience of losing a license and the loss of independence and mobility," Ms Challands said. As part of the study, Ms Challands is urging people over 65 to take part in a survey titled Online and offline connections for the over 65s. How do they influence quality of life for current and ex-drivers? "We are interested in examining how the over 65s, both drivers and ex-drivers, connect online and comparing the relationships of online connections to face-to-face connections," she said. "We want to understand if connecting online helps foster the meeting of everyday practical and social needs and helps older adults stay in touch." More information: The study is available at survey.qut.edu.au/drivingless. Hand over your keys and your SSI checks. You voted in the ronnie raygun devolution, not us! Feed the Boomers to the North Koreans in lead cans made in China!